I'm Here. I'm Queer. What the Hell do I read? 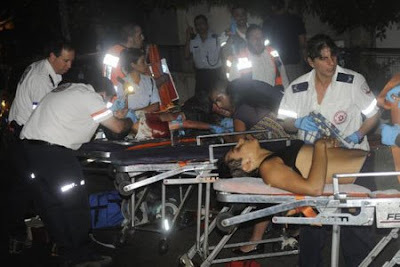 : Anti-Gay Terrorist Attack against Teenagers in Israel... What It Means, and What Can We Do? 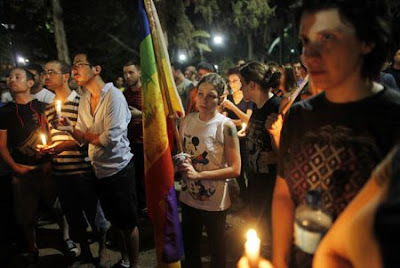 Anti-Gay Terrorist Attack against Teenagers in Israel... What It Means, and What Can We Do? A Big City's LGBT community center. Teenagers, counselors, people doing their best to live their lives, believing they're in a safe place. It's 11pm. There's a support group meeting happening in the basement. A masked gunman walks in, opens fire, and flees. 2 young people are killed. 11 are injured. Families get calls to go to the hospital, and that's how they find out their kids are gay. This all happened Saturday night, in Tel Aviv. In the aftermath of the shooting. Israelis already live under the shadow of "threat" more so than anyone here in America can really process. Bags are checked everywhere, almost every restaurant has a guard that checks you and your stuff before you can enter, and everyone seems to know someone who has been killed or hurt in a terror attack... Or just had coffee in the cafe moments before it was blown up. And with pretty much every Israeli going into the army right after high school, the entire country seems to "get" that you have to - always - watch out for your own safety and the safety of those you care about. It's a country where young kids (I'm talking REALLY young) get cell phones, so their parents can know they're okay in case of an attack. And in the midst of this intense pressure, Israelis are living their lives, raising their kids, and thriving in the only democracy in that part of the world. Because if they crumbled, if they just locked themselves in their houses and gave over to fear... then they would let the terrorists win - and they would lose the joys of being alive! 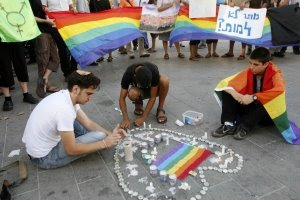 Israel has a thriving Gay community. You see it in the Big City of Tel Aviv, but it's there in Jerusalem, and elsewhere, too. But with this terrorist attack on the GLBT Center in Tel Aviv, there's all this talk about Gay Israelis going back into the closet. As if somehow, being Gay would make them less resilient. Like being Gay would make them less able to stand up and say "NO! We will not be scared into hiding. We WILL live our lives!" If, after the 9/11 terrorist attacks here in the U.S.A., if we'd all just stopped flying in planes all together - and from then on only taken trains, because we were scared, then the terrorists would have won. We didn't do that. We get our shoes scanned. We endure more security. And we keep flying. Similarly, Gay people in Israel won't go back into the closet. They should be careful - absolutely. But they won't let the terrorists win. And neither should we. We need to reach out to help Gay and Questioning Teens. Here and abroad. Let them have safe spaces. Let them feel protected. Let them know they're not alone. That they can be the heroes of their own stories! And help them find out about and get their hands on the teen books with GLBTQ characters and themes - like the ones in the left column, here! Because Books make a difference. And Because damn it, Teens are our responsibility, as a society. Let them live in peace, and thrive! Stand with me. Stand with them.